This is the fifth such hike in a year as Venezuela continues to battle the world's highest inflation rate. CARACAS - The Venezuelan government has raised the minimum monthly wage by 50% to combat the ever-rising inflation in the country. President Nicolas Maduro's announcement on Sunday (8 January) is the fifth rise in 12 months to protect workers from the country's failing economy. "To start the year, I have decided to raise salaries and pensions. In times of economic war and mafia attacks ... we must protect employment and workers' income," said the socialist president in a televised address. Critics are not happy with the move as they fear it could worsen the financial crisis in the South American nation, which is battling the world's highest inflation rate. Maduro has blamed his political opponents for the poor performance of the country's economy, but the opposition has hit back at him for "utter mismanagement". The oil-rich country's economy has been hit due to crumbling oil prices and the continuing political power struggle in Caracas. This has resulted in chronic shortage of food supplies, medicines and other basic resources. 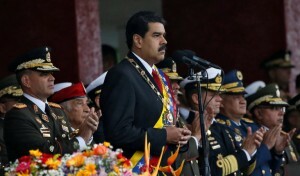 The latest increase in the minimum wage "is fair and necessary... to continue to protect jobs, stability, the right to work, to an income and to pensions," said Maduro, adding that the step was needed to shield public workers, pensioners and armed personnel. He promised to continue to hold talks with his adversaries and critics to improve the financial situation and said: "As the president of the republic, I am promoting dialogue, I am facilitating dialogue, I am married to [the idea of] national dialogue." Talks between Maduro and the opposition, which controls congress, started in October 2016 but have frequently end-up in a stalemate with both sides failing to agree on certain points. The next round of talks is scheduled to take place on 13 January in which international observers are expected to participate.